I’ve begun learning and reciting some of the daily blessings, like when waking up and on some foods. On one hand it seems like a nice thing, but it is also rather cumbersome to have to bless before and after everything you eat, and even after using the facilities. It seems a bit much — perhaps you can help me out with this. The concept of reciting daily blessings is derived in the Talmud from the verse where Moses queries the Jews, “Now, Israel, what does G-d ask of you? Only to fear G-d, to go in all His ways and to love Him, and to serve your G-d with all your heart and with all your soul…” (Deuteronomy 10:12). The word “what” in the verse, which in Hebrew is “mah,” suggests a similar word, “meah,” or one hundred. The Torah is hinting that the way to serve G-d to the utmost is to recite 100 blessings every day. The simple understanding of this is as an expression of appreciation to G-d for all the gifts He bestows upon us. On a deeper level, it brings one to recognition of G-d in every aspect of our lives. A late, elderly sage in Jerusalem once explained this to me with the following analogy: Imagine you’re driving down the street and it starts raining, and you begin seeing drops of rain on the windshield. As it rains harder, you see more drops. Soon there are so many, you don’t see any individual drops; all you see is a sheet of water. As you turn on the windshield wipers which wipe away the sheet of water, you momentarily see drops again, until once more you see a sheet of water and no drops, and this process continues. We receive so many blessings in our lives from the Al-mighty that, at times, it’s hard to even discern them at all. A cursory visit to a nearby ICU will force us to realize that every breath we take on our own is a blessing. Every heartbeat, our blood flowing properly through our bodies, our digestive system functioning, our eyes seeing and ears hearing, are all tremendous blessings — not to mention having food to eat, air to breathe, roofs over our heads, clothing to wear, etc. These constant blessings come at us with such rapidity that they become like the sheet of water, and we don’t notice them at all. The hundred blessings a day are like the windshield wipers which momentarily wipe away everything else and allow us to focus on the one “drop” we are about to enjoy or have just benefited from, such as food or drink. When one successfully uses the facilities, they have an incredible opportunity to focus in on all the amazing bodily systems that are correctly functioning and thank G-d for that. If one does this a hundred times a day, the blessings of life are no longer an imperceptible sheet, but rather a cause for constant joy, ecstasy and appreciation. On a deeper level, the Hebrew for blessing is “brachah,” which is related to the word “braichah,” a flowing stream. When one recites a brachah, they recognize G-d’s Presence in that mundane object and unlock the spirituality therein. This opens the gates for wellsprings of bounty and blessing and loving spiritual connection to flow from heaven to earth, especially through the object being blessed and all its kind. In this way, the Jew uttering the blessing and the physical world become partners with G-d in His connection to the world, making it a source of blessing for all. We have had so many holidays but now we take a break. Do you know that there are only six holidays mentioned in the Torah? If you can’t name them all, e-mail me for the answer at lseymour@jccdallas.org. We do have two regularly occurring holidays: Shabbat, of course, and Rosh Chodesh, which we celebrated on Sunday and Monday. Rosh Chodesh is the celebration of the new month; it happens 11 times during a regular year (Rosh Hashanah takes its place at the beginning of Tishrei) and 12 times during a leap year, when we have two Adars. The Jewish calendar is both lunar and solar. The moon tells us the beginning and ending of each month but the calendar must be adjusted so that the holidays always fall in their proper season, based on the sun. This is why every year the holidays are either “early” or “late” — but no one says that the holidays are right on time (do you ever wonder why?). In ancient times, people did not work on Rosh Chodesh; however, recently it has become a holiday for women. There is a midrash that when Moses was up on Mt. Sinai, the people were nervous and they demanded that Aaron build a golden calf. The women did not contribute their jewelry to build the idol. As a reward, G-d granted the women the holiday of Rosh Chodesh, so that, like the moon, women would be rejuvenated each month. 1. Observe the moon — it is a great before-bedtime together time. Keep a journal in pictures or words. 2. Find a “Rosh Chodesh spot” — take a picture each month in the spot and watch the changes of the place and the people over the year. 3. Read books about the moon, listen to moon music, draw pictures — bring in the month through the arts. 4. Say this simple blessing, which is a small part from the Kiddush Levanah, the Sanctification of the Moon, while looking at the moon: Baruch Atah Adonai, m’chadaysh chodasheem — Thank You, G-d, for renewing the months. 5. Make sure you have a Jewish calendar so that you can know the names of the months, the date of Rosh Chodesh each month and the holidays that fall during that month. Enjoy the new month of Cheshvan! Jamie, who had not received the Manactra/MCV4 meningitis vaccine (recommended by the CDC to all children after age 11), was diagnosed with meningococcemia, a deadly infection of the blood. The disease is caused by bacteria entering the cerebrospinal fluid that surrounds the brain, which irritates the meninges, the membranes that line the brain and spinal cord. “I remember lying there and my legs turned black. My legs, then my hands, knees and elbows. They were black,” Jamie said. Hers was the second confirmed case of the disease on the university’s campus last fall. The first student, according to University Health Services’ Sherry Bell, recovered completely. After three weeks in the Seton Medical Center Intensive Care Unit, Jamie was transferred to Houston’s St. Joseph’s Hospital. On Feb. 6, Jamie had surgery to amputate both of her legs below her knees, and to remove most of her digits on her hands, although fortunately, parts of both of her thumbs and two of her fingers remain. In May, she was transferred to St. David’s Hospital Rehabilitation Unit, where she remained for three weeks. There, she was fitted for, and learned to use, her prosthetic legs. Jamie’s family — including her father, the late Robert Schanbaum; her mother, Patsy; brother Nicholas, a Dallas attorney who commutes to and from Austin to help his sister; and sisters KC, a student, and Roni, a graphic designer — are former Dallas residents and members of Temple Shalom. They have been by her side, every step of the way. “There is nothing that says Jamie can’t do whatever she wants to. It may be more difficult but she’ll do it,” Patsy said. Together, the family has become involved in the National Meningitis Association and that organization’s Moms on Meningitis group. In April, their efforts with State Senator Wendy Davis and State Senator Eddie Lucio, Jr., paid off with the naming of the Jamie Schanbaum Act. It requires, as of Jan. 1, 2010, bacterial meningitis vaccinations for first-time college students living on campuses in Texas. Exceptions are made for students opting out for medical or religious reasons or “reasons of conscience.” “This was, I believe, the third time such a bill has been brought up but I was told that it was our testimony that pushed it through,” said Patsy, who testified with her son Nick while Jamie was still hospitalized. Separate and apart from the Jamie Schanbaum Act, but pertinent to the family’s goal, as of Oct. 1, all seventh-grade students in Texas must have had a meningococcal vaccine and a second dose of varicella (chicken pox survivors excluded). Depending on their shot records, students in grade seven or higher must show proof of receiving a Tdap booster, which protects against tetanus, diphtheria and pertussis (whooping cough). There are exceptions for medical or religious beliefs. In addition, kindergartners entering Texas public schools must have had two doses of Hepatitis A, two doses of varicella (unless they’ve already had the chicken pox) and two doses of the vaccine that guards against measles, mumps and rubella. In addition to getting the word out, raising funds to support Jamie’s medical expenses is at the top of the schedule. Jamie’s Dallas school, Shelton, raised funds earlier this year with a “Jean Day.” An event will be held, with a suggested donation of $20, on Saturday, Nov. 7, at the Liar’s Den at 2710 McKinney in Dallas, from noon to 6 p.m. A second event, an evening gala at Jamie’s alma mater, St. Michael’s Academy in Austin, will take place on Feb. 27. Donations to help support Jamie Schanbaum’s medical expenses can be mailed to P.O. Box 4396, Austin, TX 78765 or online at jamieschanbaumupdatesandsupport.blogspot.com. For more information on the Nov. 7 fundraiser at the Liar’s Den, or the Feb. 27 event at St. Michael’s Academy in Austin, call 214-226-8090. By Shelley Weiss, M.D., and Simma Weiss, M.D. “People are a lot more fragile than they think,” says K.C. Schanbaum, older sister of Jamie Schanbaum, who survived a battle with meningococcal meningitis this past winter. This realization surfaces in our consciousness — whether through the High Holy Days prayers, a newspaper story or the sudden illness of someone close to us. While we cannot predict or stop every possible risk to our lives, we can work hard to prevent as many as we can. We often think of vaccines as a rite of childhood, designed to prevent such “childhood illnesses” as measles, chicken pox and whooping cough. Vaccines, however, represent an important part of our preventive health strategy throughout adolescence and adulthood. Spinal meningitis is an inflammation of the fluids surrounding the brain and spinal cord. It can be caused by a variety of organisms, but one of the most severe forms is caused by a bacterium known as meningococcus. The illness begins with flu-like symptoms, but can quickly progress to neck pain, rash, loss of consciousness and sepsis (drop in blood pressure leading to organ damage throughout the body). Death occurs in about 10 percent to 15 percent of those infected. Long-term effects — including loss of limbs, hearing loss and mental retardation — occur in 10 percent to 20 percent of survivors. Meningococcal disease occurs in 1,400–2,800 people per year in the United States, killing about 300 people per year in this country. Because of the close contacts associated with the dormitory lifestyle, college freshmen are at higher risk than the general population for infection with meningococcus. Four years ago, the FDA licensed an updated vaccine for meningococcus called MCV4 (Menactra). This vaccine confers long-lasting immunity against this infection with a single dose. The CDC and the ACIP recommend routine immunization of all children with MCV4, at 11 or 12 years old. This vaccination helps to protect against the risk of meningococcal disease in high school and college. The meningococcal vaccine, along with the pertussis-preventing tetanus shot (TdaP) and the Human Papillomavirus Vaccine for girls (HPV or Guardasil), can be provided by your pediatrician or family physician at your child’s 11- or 12-year-old physical. Let us use the story of Jamie Schanbaum to remind ourselves of the importance of adolescent and adult vaccination in all our lives. Shelley Weiss, M.D., is a pediatrician and Simma Weiss, M.D., is a family physician at Healthy Texan Pediatrics and Family Medicine in Medical City Hospital. This article does not constitute formal medical advice. Specific questions about your or your child’s health should be addressed to your personal physician. Appointments with either Dr. Weiss may be made by calling Healthy Texan Pediatrics and Family Medicine at 972-566-4286. HBOC is an inherited cancer susceptibility syndrome. The hallmarks are multiple family members with breast cancer or ovarian cancer or both, the presence of both breast and ovarian cancer in a single individual and early age of breast cancer onset. 2. What causes the majority of HBOC syndromes? Mutations in the BRCA1 and BRCA2 genes result in HBOC syndromes. These genes are both autosomal dominant, which means an individual needs to inherit only one abnormal gene to be at risk for HBOC syndrome. 3. What percent of breast and ovarian cancers are due to BRCA1 and BRCA2 mutations? Approximately 10 percent of ovarian cancer and 7 percent of breast cancer are due to BRCA mutations. However, only 4 percent of individuals with these mutations have been identified. 4. What is the prevalence of BRCA mutations in the general population? It is estimated that one in 500 individuals is a carrier of the BRCA mutation. 5. What is the prevalence of the BRCA mutation in the Jewish population? It is estimated that one in 40 Ashkenazi Jews carry the BRCA mutation. 6. What is the risk of breast and ovarian cancer if I carry a BRCA mutation? For a woman with a BRCA1 mutation, the lifetime risk of ovarian cancer is 39 percent to 46 percent. For a woman with a BRCA2 mutation, the risk of ovarian cancer is 12 percent to 20 percent. The estimated lifetime risk of breast cancer with a BRCA1 or BRCA2 mutation is 65 percent to 74 percent. 7. How is testing for the BRCA mutation performed? Blood is obtained at your physician’s office and then sent to a laboratory which tests for the mutations. Appropriate counseling should be performed before testing is done. 8. Does insurance cover the test and will I be able to obtain health insurance if I test positive for the BRCA mutations? Most insurance companies will cover BRCA testing in “high-risk” individuals. High-risk is defined as individuals with personal history of breast cancer diagnoses prior to age 45 with or without family history; breast cancer diagnosed at age 50 or younger with a family history of breast cancer diagnosed by age 50, or family member diagnosed with ovarian cancer; family history of male breast cancer; Ashkenazi Jew with family history of breast or ovarian cancer. Federal laws are in effect which prohibits medical insurance companies from discriminating against individuals who are BRCA carriers. 9. What can be done if I test positive for the BRCA mutation? Prophylactic simple mastectomy decreases the risk of breast cancer by 90 percent. Removing both ovaries and tubes when childbearing is complete decreases risk of ovarian cancer by 96 percent and breast cancer by 68 percent. Oral contraceptives decrease ovarian cancer risk by 60 percent with no proven increase in breast cancer. Increased surveillance with breast MRIs and more frequent mammograms may be performed. Pelvic ultrasounds and CA125 markers performed every six to 12 months may be ordered. 10. How can I find out more about HBOC? Start by contacting your physician and discussing your family history and risk factors for HBOC. In addition, Myriad Genetic Laboratories performs the test and provides patient education material on their Web site at www.myriadtests.com. Facing Our Risk of Cancer Empowered (FORCE) at www.facingourrisk.org is a resource for those individuals or families who carry the BRCA mutation. Eric Jacoby, M.D. (ericjacoby@pwhcare.com) is an obstetrician and gynecologist in Plano. When 28-year-old Rochelle Shoretz was diagnosed with breast cancer in 2001, she had nowhere to turn. The organizations, both Jewish and secular, that she contacted for support put her in touch with aunts and grandmothers. It wasn’t until a neighbor introduced her to another young Jewish woman going through the same difficulties that she was able to lean on someone else who truly understood what she was experiencing. Five months later, in December 2001, Shoretz founded Sharsheret, a national organization based in Teaneck, N.J., that provides aid to young Jewish women (defined as premenopausal) with breast cancer. The organization will hold a national teleconference, “Breast Cancer and the Next Generation,” on Nov. 4 (see info box). About 850 women from 39 states are currently enrolled in Sharsheret’s signature service, the Link Program, and thousands more call in for free information and materials, according to Director of Operations Elana Silber. The Link Program matches women of similar backgrounds and lifestyles from across the country so they can discuss questions and concerns with like-minded people. She added that the organization is careful to match people with similar religious values and similar problems, and that Sharsheret is open to women from all denominations of Judaism. She gave the example of how an Orthodox woman who recently underwent a mastectomy might seek advice on how to handle herself at a mikvah. In addition to the Link Program, Sharsheret offers nine other services, including education and outreach; quality of life, which addresses the cosmetic side effects of treatment; and individualized counseling regarding hereditary and genetic issues having to do with breast cancer. The nonprofit is also in the planning stages of providing support to women with ovarian cancer, which it hopes to launch in full force in 2011, according to Silber. For more information, call 866-474-2774 or visit sharsheret.org. Josh Sayles is a staff writer at Jewish News of Greater Phoenix. Quick: Who won the very first Best Actress Emmy in history? I’ll give you a little assistance: The year was 1951. No one comes to mind? Here’s another clue: Eight years later she won a Tony Award as Best Actress (Dramatic) for “A Majority of One.” If you answered Gertrude Berg — you’d be right! Rarely does a film come along that not only educates but entertains in equal measure. “Yoo-Hoo, Mrs. Goldberg” is the latest entry from documentary filmmaker Aviva Kempner (“The Life and Times of Hank Greenberg”). Using archival footage from TV’s early days and interviewing family members and celebrities (and a Supreme Court judge), Kempner brings to life the lady who at one time was the most famous woman in America. For those who were not fortunate to see her TV program in its heyday, she has often been credited with creating TV’s first sitcom, modeled on her radio show “The Rise of the Goldbergs” and character Molly. She not only starred in the radio and TV program, but she was the creator, writer and producer in the day when most moms were stay-at-homes. At a tumultuous time in our history, “Mrs. Goldberg” was a welcome sight in living rooms across the country. Leaning out her window, she welcomed the audience into her world as she talked directly into the camera and later with neighbors in her apartment building. The familiar wail, “Yoo-hoo, Mrs. Goldberg,” beckoned her to the sill, where the friends chatted about life, modeled hats and dispensed advice. Although she portrayed a blue-collar Jewish matriarch living in the Bronx, she spoke (with an accent) to a country that was communally dealing with the Depression and mitigating family problems. In this sense, the program transcended its religious boundaries and its popularity soared. I want to thank Ms. Kempner not only for transporting me back to the Bronx, but for re-introducing us all to a woman who may have been temporarily forgotten, but certainly left her mark on our national cultural map. Once a year, I get to make this proclamation: If you see one documentary this year, “Yoo-Hoo, Mrs. Goldberg” should be the one! I was fortunate to get a chance to speak with the director of “Yoo-Hoo, Mrs. Goldberg,” Aviva Kempner. We spoke about the film, the perils of fundraising for documentaries and even a little Jewish geography. Here’s an excerpt. Susan K. Wilkofsky: I was born and lived in the Tremont section of the Bronx, so thanks for the walk down memory lane. Besides being so entertaining, the film was educational as well. It hit on all cylinders! Thank you. Aviva Kempner: Ah, my pleasure! Now do you think that folks in Dallas are going to go? SKW: Absolutely! I’ll tell them to! 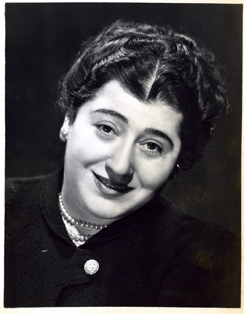 How did you get involved with Gertrude Berg’s story? AK: I knew about her; I was trying to figure out what to do next and I went to the Jewish museum. There was a great exhibit called “Jews Entertaining America.” The museum had a re-creation of the Goldbergs’ living room. SKW: At what point did you read her bio by Glenn Smith, “Something on My Own”? SKW: That’s a nice touch! What specifically interested you in Gertrude Berg? The fact that she was an early, visible feminist? AK: She was so talented. She would get up every morning and write, then go and produce. She developed the most long-lasting positive portrayal of American Jews that you’ll ever see, during the time of the greatest domestic anti-Semitism. Plus, she developed that character that was beloved way beyond the Jewish community, and of a mother figure that she didn’t have in her own life. She [was] the right person at the right time. SKW: I enjoyed your [documentary] about Hank Greenberg. Many of your films deal with Jews who were heroes in their day and age, but have been somehow forgotten. Can you address that? AK: It’s bringing up these stories of heroic figures especially at the time of so much domestic anti-Semitism. [They were heroes] in athletic form or in creativity; time passes and people don’t remember heroes past — that’s why I do these films. What’s interesting is there are four bio-flicks out this year about important women around that period: Amelia Earhart, Coco Chanel, Julia Child and Gertrude Berg. It’s wonderful that their stories are coming to the screen. SKW: It’s interesting that she played a stereotypical Jewish mother on TV and radio, but she wasn’t one in real life. SKW: Many of your films deal with famous folks who include the name “Berg.” Who’s next — Ingrid Bergman? SKW (also laughing): Seriously, what’s your next project? AK: There was a very famous Jewish philanthropist named Julius Rosenwald who championed Booker T. Washington’s project and together they built over 5,000 schools in the rural South. It’s a great black/Jewish story. SKW: I look forward to learning about the next unsung hero. The Temple Emanu-El Brotherhood will begin collecting coats and other winter clothing for the needy on Sunday morning, Oct. 18, with a drop-off point in the temple parking lot on Hillcrest Road just north of Northwest Highway in Dallas. “Many children in Dallas would be colder this winter if it weren’t for the generous support of Dallas residents who want to make a difference by contributing their winter clothing to Coats for Kids,” said Stephen Shore, Temple Emanu-El Brotherhood president. Each year, Coats for Kids collects coats, scarves, mittens, gloves and boots. All kid and adult sizes are welcome. Clothing will be distributed to deserving individuals via the East Dallas Police Store Front on Bryan. Shore added: “As in past years, our effort includes the Preston Hollow Presbyterian School and Congregation Beth Torah. Boy Scout Troop 729 will be manning the collection point. And this year we’re asking the Temple’s Religious School students to go through their closets and participate by donating their clothing. Those missing the scheduled collection may drop their donations off at the Temple Emanu-El Brotherhood office anytime during October or November. On Sept. 10, Murray Stein of Allen installed his latest sculpture, “Schubert’s Trout Quintet,” in the Strathmore Music Center of North Bethesda, Md. The Strathmore, which seats almost 2,000, is the second largest concert hall in Maryland, and hosts the Baltimore Symphony Orchestra in 30 concerts per year. For those not familiar with the “Trout Quintet,” it was written by Schubert to honor a poem about a fish. The sculpture displays a violin, viola, cello and double bass full-size in skeletal form, made of an industrial laminate composed (pun) of tulip poplar. The overlap between the violin and viola forms the outline of a fish, i.e., the trout — a rainbow trout at that, because it is highlighted with dichroic glass. The keyboard was turned on a lathe as a bottomless cylindrical maple bowl, then cut into fourths and reassembled as a wavy entity, which weaves under and over some of the skeletal elements. Don’t for one minute believe that the wood really comes from a rubber tree. The flats and sharps are real ebony. One of Stein’s other works is “Lest We Forget,” a sculpture for the Dallas Holocaust Museum, which won first place in the Texas Sculpture Association’s 25th anniversary show last year. His “Suspended Chord,” designed for the upcoming Collin County Music Hall, is presently housed in the Offices of the Plano Symphony Orchestra. For over fifteen years, the Dallas Area Agency on Aging has held county-wide spelling competitions in both English and Spanish, offering the opportunity for seniors from across Dallas County to compete for cash prizes and the honor of being named the top spellers in the region. This year’s events at the Bachman Recreation Center did not disappoint. Seventeen seniors entered the English competition, held on Oct. 17. After many rounds of heated competition, first-place honors went to Phyllis LaVietes, who represented Windsor of Dallas Senior Living. LaVietes is assistant editor of the Texas Jewish Post. Ten contestants entered the Spanish competition, held on Oct. 10, and spelled their hearts out round after round. In the end, first place went to Maria Isuara Galicia, representing La Voz del Anciano. Dallas Jewish War Veterans, Dr. Harvey J. Bloom Post #256, ­nominated Travis Upham, the young man who was chosen winner of National JWV’s Olympiad Award for 2009. The honor, which carries an award of $1,000, was formally presented to Travis during a recent breakfast meeting of the post and its auxiliary at the Jewish Community Center. Created in memory of Israel’s 11 Olympic athletes who were brutally murdered by PLO terrorists at the Munich games in September 1972, the annual award honors a high school student based 60 percent on athletic accomplishment, 40 percent on scholarship and community service. The honoree does not have to be Jewish. Travis, a Catholic, graduated in the spring from Bishop Lynch High School in Dallas, where he was a baseball star and an All-State soccer player. He has just begun his freshman year at the University of Oklahoma, planning to major in business. First named by the local post to compete for the Olympiad Award, Travis was then chosen as the candidate to represent the JWV region encompassing Oklahoma, Louisiana and Arkansas as well as Texas, and was then declared a national winner by JWV’s Washington headquarters. Travis and his parents, Mr. and Mrs. Steve Upham, attended the Sept. 27 meeting where the $1,000 check was presented on behalf of National JWV by Commander Jerry Benjamin, Post #256. Under Fleisher’s leadership, Jewish Family Service has expanded its services, including support groups, employment assistance, case management and independent living services for the elderly. JFS has developed new services such as the family violence intervention program, school mental health program, breast cancer support services, psychological testing and speech and language services for special-needs children and adults, and the Rabbi Gerald Klein high school summer internship. Fleisher’s commitment to providing the highest quality services has merited national recognition for Dallas JFS. The public is cordially invited to attend. A lox and bagels breakfast will be served for a nominal fee. Dancers of all ages are invited to the Wednesday Dance Night on Oct. 21 in the Zale Auditorium of the Aaron Family Jewish Community Center. Live music will be presented by the Chuck Arlington Band from 7 to 9 p.m.
With the paid admission of $5, free ballroom dance lessons will be given from 6 to 7 p.m.
Dance hosts for unescorted ladies will be on hand. Light refreshments will be served. The program is presented by the JCC and Temple Emanu-El Couples Club. I admit it — I am a biblioholic! That’s the addiction to buying books and I’ve got it bad. Every year at Simchat Torah (my favorite holiday), I try to absolve myself of guilt — we are the People of the Book and we never stop reading the Torah. That must make it OK to love books, read books and even buy books. Each new year, I shop before Rosh Hashanah to find wonderful books to take to shul. Yes, I read in shul! 2. Did you leave a legacy? 3. Did you set a time to study? 4. Did you have hope in your heart? 5. Did you get your priorities straight? 6. Did you enjoy this world? 7. Were you the best you could be? These may not be the questions you might have imagined, so maybe start your family discussion on what you think are the questions you would be asked; would you keep some of these or find very different ones? The questions are the first step. Talk about why each particular question; what is really being asked of us? For the seven questions above, the answer is hopefully the same for each one — THE ANSWER WE WANT IS YES! But the real questions are how and what and why: how can you be honest, how do you leave a legacy and what will that legacy be, what should I study, why is study important, what is important about hope, and more questions about questions. Keep reading and keep questioning — it’s the Jewish way!